Biogas produced in the digester, can be utilized in several different installations: producing heat, electricity or upgrading the biogas to biomethane, which can be used as transport fuel or fed into the natural gas grid. 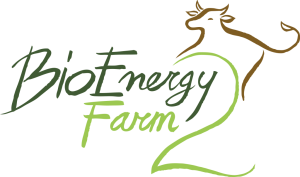 In the BioEnergy Farm 2 scan, several options of gas utilization (direct heat, heat and electricity, and gas upgrading) can be selected. Click on the tabs below to find more information on the different techniques. For more information, feel free to contact one of our partners. Biogas can be used as fuel for a CHP installation. CHP means Combined Heat and Power and refers to the cogeneration of electric energy and heat. Basically, it is a gas powered engine with a generator connected to it. The engine drives the generator, which in turn produces electricity. As a result of the internal combustion, the gas engine also generates heat. This heat leaves the engine through the exhaust gases and the cooling liquid. By using heat exchangers, this thermal energy can be captured and used productively. Ideally, a CHP-installation is located close to the consumer of heat. It is possible to transport heat, but that requires highly insulated piping which is very expensive and, nevertheless, results in heat losses. Biogas and electricity are both much easier to transport efficiently. Should the CHP be located far from the fermenter, additional measures have to be taken to deliver heat to the fermenter. This could be for example a mini-CHP, but also a biogas heater. If the fermenter and the CHP are close to each other, the CHP generally delivers the required thermal energy for keeping the fermenter at the right temperature. Biogas generally has a lower quality than natural gas. Its heating value is lower. Furthermore, biogas can also contain contaminants that are harmful to the engine, such as sulphur compounds, halide compounds, acids and solids. Often biogas is treated in order to reduce the level of contamination and enhance the performance and lifetime of the gas engine. The maximum allowed level of contamination can vary amongst different manufacturers, so this should always be a point of attention! Biogas by itself usually has an relatively low energy content (compared to natural gas) and can be burned directly in a boiler to generate hot water or steam. Boilers tend to be fairly simple and robust and hence very little gas cleaning is required, keeping the capital costs and operating costs low. It is worth noting that if heat is being exported, the cost of the infrastructure to transport the heat may be many times that of the boiler itself. Therefore a heat network is only favourable when the heat demand is close by or on the farm itself. If the distance to the end-use is bigger, it can be favourable to transport the biogas itself and install a biogas fired boiler at the end-user. Instead of burning biogas in a CHP installation and generating power and heat, the biogas can also be fed into the gas grid. This is especially attractive when the heat generated by a CHP cannot be used. The biogas needs to be upgraded to the same quality as the natural gas before it can be fed into the gas grid. One major difference between biogas and natural gas is the methane content. As mentioned earlier, the methane content of biogas is typically between 50 to 60%. The methane content of natural gas is typically in the range from 85 up to almost 100%, depending on the country/location. Feeding raw biogas into the gas network without upgrading would result in big problems for the gas customers. Most gas equipment is designed to work on gas with a certain methane content. So to be able to feed the gas into the grid, the CO2 and other impurities need to be removed from the biogas. Currently, several techniques of biogas processing are available: pressure swing adsorption, absorption by water or organic solvents scrubber, permeation by membranes or cryogenic upgrading. All techniques have their own advantages and disadvantages. The best option depends on the size of the biogas plant and the availability of heat and electricity.